Meningiomas occurring in the first two decades of life are uncommon, accounting for only about 1-2% of all brain tumors. , Clear cell meningioma (CCM) is a rare phenotype, with a potentially aggressive clinical course and risk of recurrence. ,, The occurrence of this tumor in the supratentorial space is rare and adds to the uncertainty about its clinical course and prognosis. We report a case of such tumor at this unusual location and discuss about the dilemmas associated with the management and long-term prognosis. A 15-year-old male child presented with history of worsening right-sided weakness of 2 years duration. He had progressive vision loss in the left eye for the past 1 year. He had multiple episodes of focal-onset generalized tonic clonic seizures with poor drug compliance. Headache with projectile vomitings had started lately. On clinical examination, the patient was blind in the left eye, with a normal right eye. There was mild right-sided seventh nerve weakness and hemiparesis. 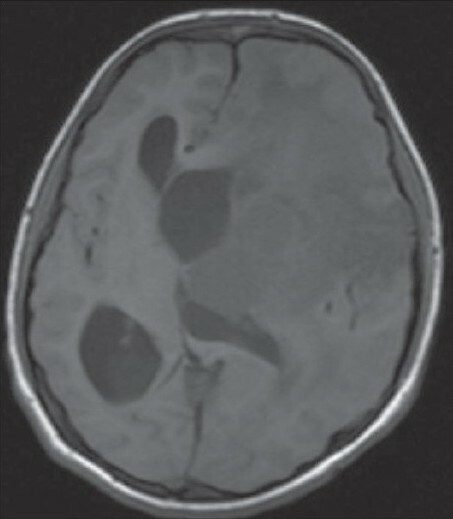 A magnetic resonance imaging scan of the brain revealed a left-sided large supratentorial tumor extending from the brain surface in the frontal and parietal cortex to the atrium and frontal horn of the lateral ventricle, causing significant compression [Figure 1]. There was brain edema with evidence of tentorial herniation. The tumor had both solid and cystic components [Figure 2]. The tumor showed heterogenous contrast enhancement after gadolinium injection [Figure 3]. Taking into consideration the radiological findings, a possibility of primitive neuroectodermal tumor was made. At surgery, after the bone flap was elevated, the cystic component of the tumor was found to be infiltrating the duramater near the lateral parietal region, causing an impression over the inner surface of the bone. The cystic component of the tumor contained xanthochromic fluid. The solid component was firm, moderately vascular and poorly suckable. A gross total resection of the tumor was performed along with resection of the infiltrated duramater overlying the parietal lobe. The patient had complete relief of headache and vomiting in the postoperative period and was free of seizures on phenytoin. A postoperative computed tomography (contrast) scan of the brain [Figure 4] revealed total excision of the tumor. 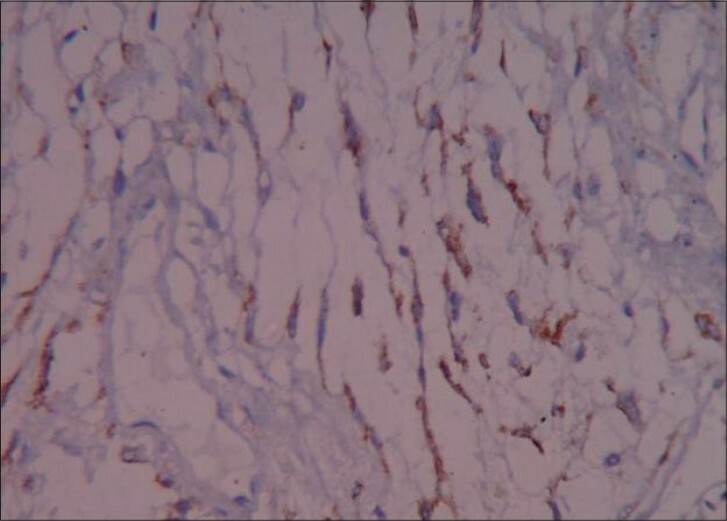 Histopathology of the tumor revealed a diagnosis of CCM WHO grade II. The tumor was composed of lobules of loosely arranged cells set in a very loose myxoid stroma. The cells had scanty cytoplasm with indistinct cell margins and slender ovoid nuclei, some with intranuclear cytoplasmic inclusions [Figure 5]. The tumor cells were positive for Epithelial membrane antigen (EMA) [Figure 6] and vimentin and negative for S-100, synaptophysin, Glial fibrillary acidic protien (GFAP), cytokeratin and desmin. The MIB -1 index of the tumor was 8%. The patient is doing well at 18 months of follow-up. 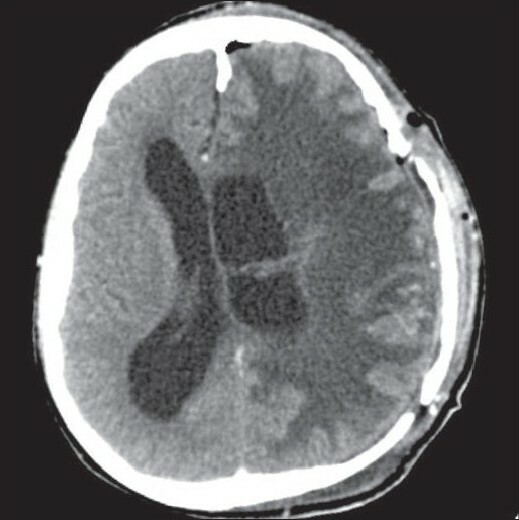 This child presented with a lesion in the left frontoparietal region. Such a location of the tumor with absence of any subarachnoid or CSF seedling is extremely rare. The radiological study revealed the tumor to be heterogenous in consistency with solid and cystic components and had a nonuniform enhancement after gadolinium injection. At surgery of this child, it was revealed that the cyst had caused an impression on the inner surface of the parietal bone, which may be suggestive of the gradual progression of the tumor. With reference to the literature review, CCM may have benign histological characteristics, but, clinically, it shows a high risk of progression and recurrence. Given the large dimension of the tumor (6-7 cm), local impression on the bone and long duration of symptoms, the rate of growth of the tumor seems to be slow in this case. The MIB-1 index in the patient was 8%, making the course of illness unpredictable. The recurrence rate for these tumors has mainly been reported with reference to spinal CCM and the guidelines for therapy are based there upon. Given the behavior of the tumor in the present case, we can safely recommend a close follow-up in the postoperative period, with radiotherapy reserved for cases with recurrence. 1. Colen CB, Rayes M, McClenden J, Rabah R, Ham SD. Pediatric spinal clear cell meningioma case report. J Neurosurg Pediatr 2009;3:57-60. 2. Germano IM, Edwards MS, Davis RL, Schiffer D. Intracranial meningiomas of the first two decades of life. J Neurosurg 1994;80:447-53. 3. Jain D, Sharma MC, Sarkar C, Suri V, Garg A, Singh M, et al. 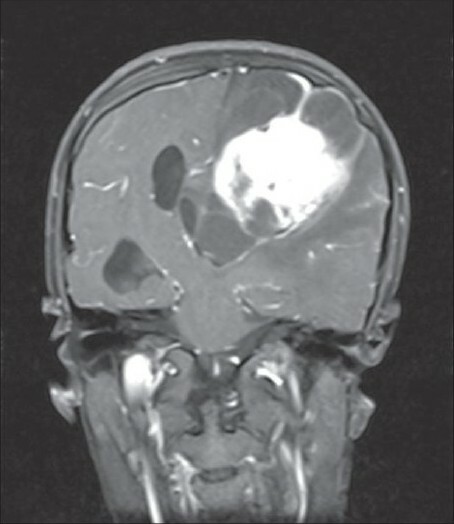 Clear cell meningioma, an uncommon variant of meningioma: A clinicopathological study of nine cases. J Neurooncol 2007;81:315-21. 4. Jallo GI, Kothbauer KF, Silvera VM, Epstein FJ. Intraspinal clear cell meningioma: Diagnosis and management: Report of two cases. Neurosurgery 2001;48:218-21. 5. Lee W, Chang KH, Choe G, Chi JG, Chung CK, Kim H, et al. MR Imaging features of clear cell meningioma with diffuse leptomeningeal seedling. AJNR Am J Neuroradiol 2000;21:130-2. 6. Ma L, Liu WK, Wang K, Shrestha B, Zhang YK. Intracranial clear cell meningioma. Acta Neurochir (Wien) 2009;151:373-8. 7. Miller AA, Ramsden F. Malignant meningioma with extracranial metastases and seeding of the subarachnoid space and the ventricles. Pathol Eur 1972;7:167-75. 8. 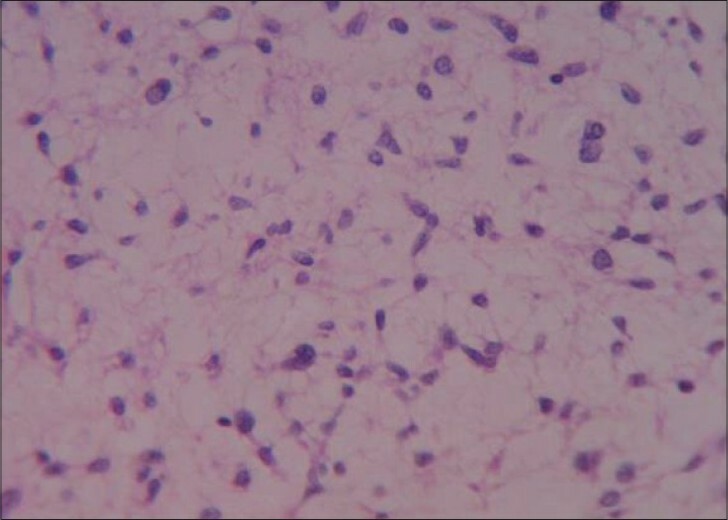 Oviede A, Pang D, Zovickan J, Smith M. Clear cell meningioma: Case report and review of the literature. Pediatr Dev Pathol 2005;8:386-90. 9. Teo JG, Goh KY, Rosenblum MK, Muszynski CA, Epstein FJ. Intraparenchymal clear cell meningioma of the brainstem in a 2-year-old child: Case report and literature review. Pediatr Neurosurg 1998;28:27-30. 10. Tufan K, Dogulu F, Kurt G, Emmez H, Ceviker N, Bavkaner MK. Intracranial meningiomas of childhood and adolescence. Pediatr Neurosurg 2005;41:1-7. 11. Zorludemir S, Scheithauer BW, Hirose T, Van Houten C, Miller G, Meyer FB. 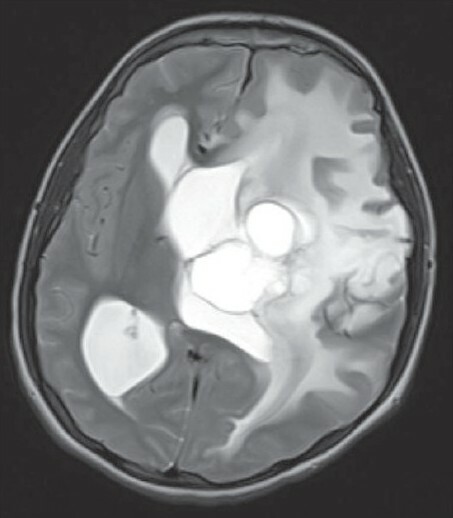 Clear cell meningioma: A clinicopathologic study of a potentially aggressive variant of meningioma. Am J Surg Pathol 1995;19:493-505. Li, Z. and Zhang, Y. and Wang, E. and Wang, Z. and Li, W. and Huang, S. and Li, J.
Mallya, V. and Singh, A. and Sharma, K.